If the organizers of Mars One – the project to establish a permanent human settlement on Mars – needs something to help bring up their recruitment numbers, this could be it. New photos from the Red Planet show that the Martian surface is dotted with mysterious blue pools and lagoons. If they’re filled with water or some other non-lethal but refreshing liquid, Mars could be the perfect place for extra-terrestrial swimmers, sunbathers and backyard party lovers. 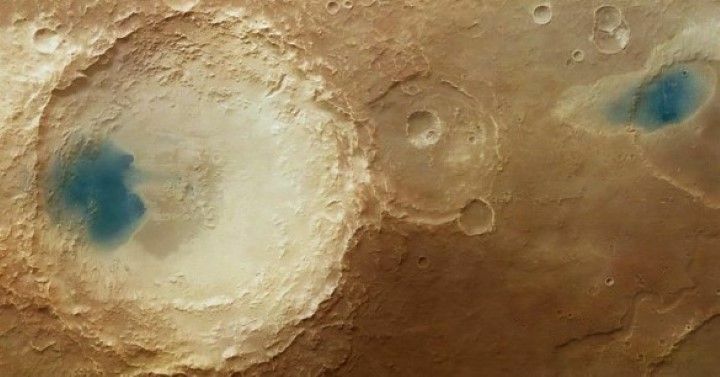 The images were taken in November 2014 by the Mars Express’s High Resolution Stereo Camera and show the Arabia Terra region which is covered with craters of varying sizes, shapes and depths. A number of the craters show what appear to be blue pools that are in sharp contrast to the reddish surface around them. Is this the evidence we’ve been looking for of water on the surface of Mars? Is this a hint of blue liquid water? No, it is an optical illusion caused by the image processing. The blue-hued patches lying within the ragged craters are actually dark sediments that have built up over time. Again, this is due to the winds, which carry dark, volcanic, basalt-rich deposits across the planet. While it’s true that Martian winds can reach 60 mph (100 km/h), hard enough to blow piles of dirt up against the walls of craters, why haven’t we seen these pools before in previous images? And why are they blue and not just a darkish shade of volcanic ash? Is the ESA telling the truth about these mysterious blue pools? Or did these photos slip out before they could be removed or photoshopped by space scientists who don’t want us to know about these resorts on Mars? Is Mars One already telling Californians they can escape the drought on Earth by moving to the Red Planet? Optical illusion? Martian backyard pools? Secret water reservoirs? Mars One recruiting ploy? Something else?